At NatureBridge, we foster environmental literacy to sustain our planet. 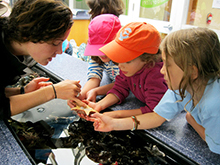 NatureBridge provides hands-on environmental science programs for children and teens. Our multi-day programs take place outdoors in the magnificence of nature’s classroom, where students are immersed in the wonder and science of our national parks in Yosemite, Golden Gate, Olympic, Santa Monica Mountains, Channel Islands, and Prince William Forest. Founded as Yosemite Institute in 1971, today NatureBridge welcomes more than 700 schools and 30,000 students and teachers each year to our six campuses. After more than 40 years of teaching and inspiring students, NatureBridge has provided life-changing experiences for more than 1 million participants and is a national leader in the field of environmental education. NatureBridge environmental science programs are inclusive. Access for all to transformational science experiences and diversity of participants and educators are core organizational values. We strive to make our programs available to students from all communities and work intentionally to bring students from underserved communities to our programs and to our national parks. More than 50% of our participating schools receive scholarship support, and more than 30% of our students are from underrepresented communities.